E ngā manu taki, e ngā manu tāiko o Te Whare Wānanga o Waitaha, tēnā koutou. Kua takoto anō tēnei mānuka ki a tātou i tēnei wiki, e Te Wiki o te Reo Māori – nau mai, tauti mai! Ka hiki tātou i tēnei wero kia rere te reo ki ngā kokonga katoa o tēnei whare wānanga. Nā reira e te whānau whānui o UC, hīkina te mānuka, tukua te reo Māori kia hāro ki tōna keokeonga! Karawhiua! Greetings to everyone here at UC. Māori Language Week is back and so too is the opportunity for us all to use, embrace and value te reo Māori in all that we do. Over this next week I am encouraging all of you to welcome this challenge by getting involved and participating in some of the great reo Māori events and initiatives which will be taking place here on campus. Take up the challenge and support the use of te reo Māori so that it will soar across all areas of our university! Go for it! 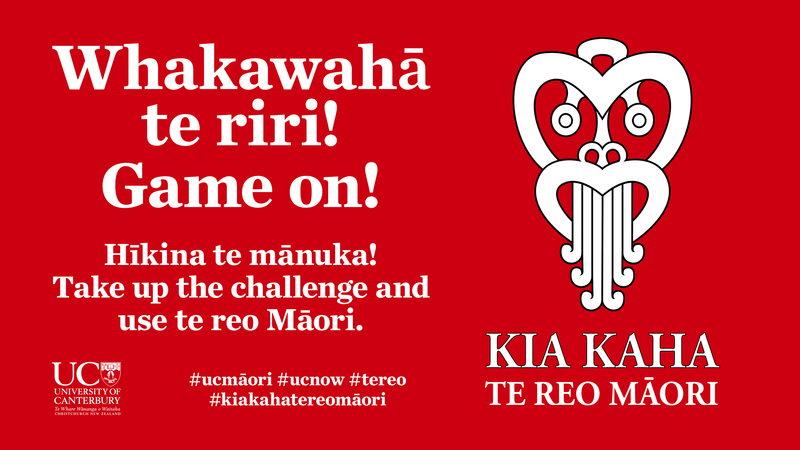 Te Wiki o te Reo Māori is one week of our year where we can show how we support and value the Māori language here at UC by using the reo we have while supporting others to do the same. Don’t be shy – get involved and make the most of the range of reo Māori activities and events happening across our campus this week – kia kaha te reo Māori! Beyond Te Wiki o te Reo Māori there are many other ways that you can further develop your Māori language skills and deepen your bicultural competence and confidence here at UC, by enrolling to complete a Te Reo Māori course at Aotahi or registering to take part in the Tangata Tū, Tangata Ora and Te Reo Māori for the Workplace workshops. Whilst Te Wiki o te Reo Māori provides us with the opportunity to support the value of the Māori language in everything we do, the challenge for us all is to continue using what we have – everyday – on an ongoing basis. E hoa mā – whakawahā te riri!